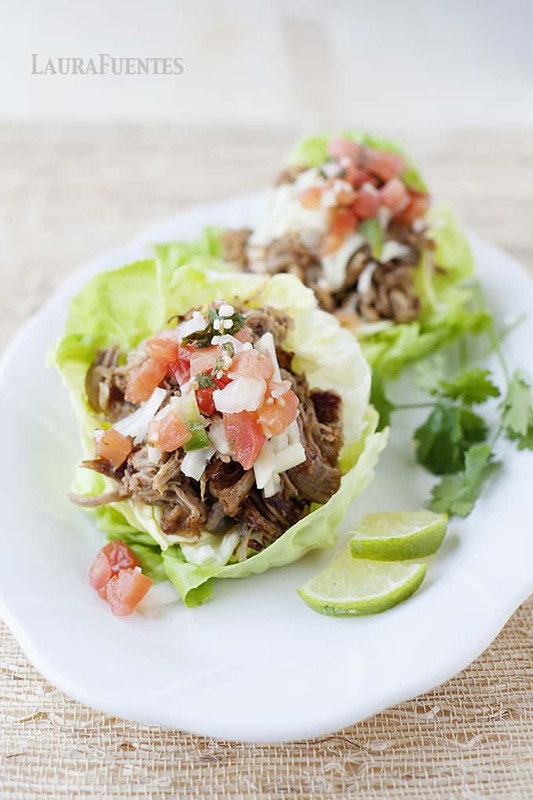 I love the versatility of recipes like my Slow Cooker Pork Carnitas, where one meal can be presented in a variety of ways. 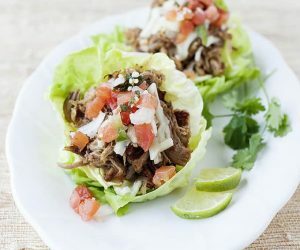 With that particular recipe, of course, serving the pork carnitas as tacos were the most obvious way, and today I’m excited to share another fun version. 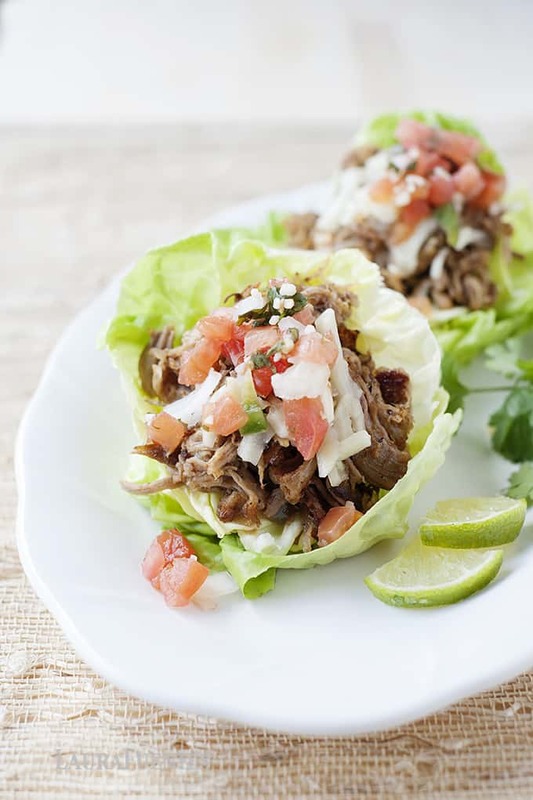 Making these delicious carnitas in the slow cooker is super simple; and of course, I have a quick video for you to make your Taco Tuesday more awesome! ﻿ This summer, I’ve become a big fan of meals served in lettuce cups. 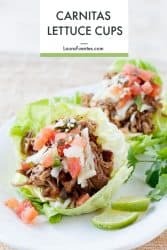 I love crunchy foods and the lettuce wrapping around my flavorful carnitas meat and additional toppings is the next best thing to taco night. 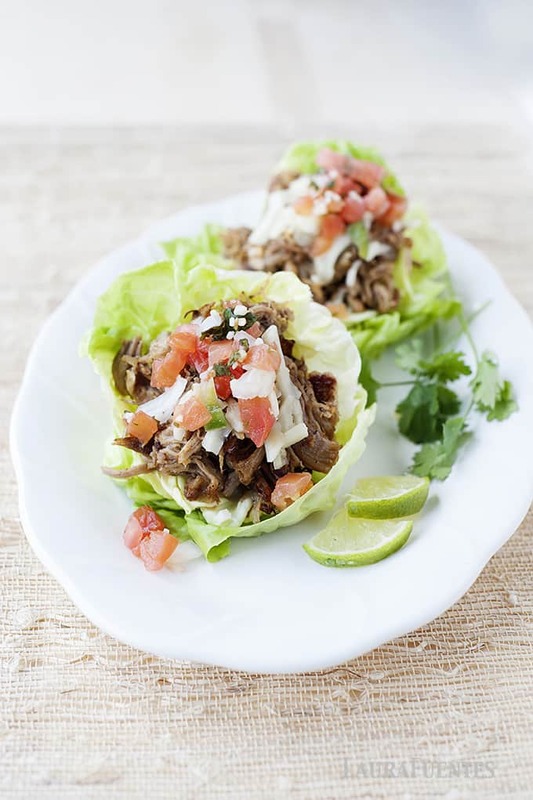 These pork carnitas lettuce cups have become one of my favorites for sure. Just by browsing my YouTube Channel, you’ll see that there are other lettuce cup recipes you’ll simply won’t be able to resist. By the way, if you are not subscribed to my channel, you should, it’s free, and a new recipe video comes out every single week! And then, there are the toppings. Tacos and lettuce cups are the equivalent of pizza toppings but cold. My favorite thing to add is avocado slices or fresh guacamole. Some days that’s all I add, a large scoop of guacamole and call it a day; others, I pile it all on, some quick blender salsa, a little shredded Monterrey jack cheese, a dab of sour cream, some extra lime and a little cilantro-which goes a long way. What I love about the pork carnitas recipe is that one batch goes a long way. You can use leftovers in many ways, over salads, reinvented into a quick vegetable hash, or even into a sandwich on your favorite roll or hoagie! Or use it the next day for easy homemade nachos! If you love tacos, check out all my other taco recipes on this blog. Many are from my cookbook, The Taco Tuesday Cookbook! What is your favorite thing to eat inside a lettuce cup? This recipe is one of 50 recipes inside the Taco Tuesday Cookbook! In a small dish, combine the oregano, cumin, chili powder, and olive oil and rub all over the shoulder roast. Place pork roast inside the slow cooker. Toss in onion, garlic, and jalapeño. Squeeze orange halves into the slow cooker and add them in. Cover and cook for 8 to 10 hours on low or 4 to 5 hours on high. Yum! We are so into lettuce wraps right now. Tons of flavor but without the carbs. This looks like a delicious end of summer recipe. Thanks for sharing! Oh, my, god!! These were absolutely amazing! I love how crispy the pork came out! Even my picky kids asked when I would make it again! Thank you!!! This was so delicious! I made this monday. I added a little extra garlic and some garlic powder (clearly, I love garlic), and my family thoroughly enjoyed it. We enjoyed it so much that I’m making it again today. In fact, it’s in the slow cooker as I type this. Thanks for this awesome recipe! 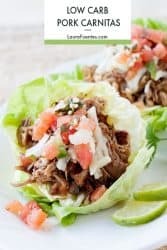 is ridiculously easy, the ultimate set and forget slow cooker recipe and the best way to get perfect crunchy brown bits while keeping the inside super moist! Get it right every time THIS RECIPE IS NO FAIL.